Get Directorate General of Sports KPK Jobs 2019 NTS Form Download from nts.org.pk. Sports Department KPK Jobs are announced and Applications are invited for the vacant positions in the Directorate General of Sports KPK from eligible candidates for the following positions given below. 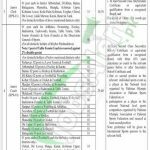 Jobs in Directorate General of Sports KPK are such as (Assistant, Computer Operator, Junior Clerk, Junior Coach). The appointment will purely be on contract basis which is extendable on satisfactory performance of an individual. Candidates wanted to apply for these positions are suggested to read the criteria carefully and according to the criteria, above-mentioned positions are for those who possess any of the following degrees such as Bachelors, Intermediate, Matric with relevant experience and skills. So, only suitable candidates meeting criteria should apply as per the following how to apply procedure given below as per the rules of NTS. The last date for submission of application is February 01, 2019. Last Date to Apply: February 01, 2019.